Thanks to some well-placed tweaks and deeper features, this is the most refined and powerful version of Reason we've seen yet. Deeper audio editing. Easily create parallel channels and buses. Revamped EQ is fantastic. MIDI out is simple and effective. Huge range of built-in sounds. Not a particularly cheap upgrade. 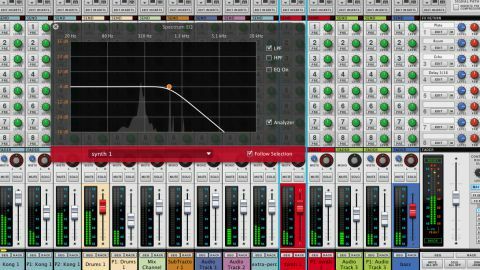 The new analyser/EQ and tweaked mixer are brilliantly implemented. Reason's new rack devices - External MIDI Instrument and Audiomatic. Editing audio is now easier than ever. On paper at least, Reason 7 is certainly less of a showstopper than the majority of the recent updates that preceded it. Since the release of Reason 5 in 2010, Propellerhead has been expanding and revamping the formerly boxed-in and MIDI-only application at a remarkable rate. Version 5 introduced the excellent Kong Drum Designer, built-in sampling and revamped sequencing, while Reason 6 brought audio into the mix and introduced Record's beautifully recreated SSL-style mixer as a central feature of Reason. Despite being just a 'point' update, last year's upgrade to version 6.5 was possibly the most revolutionary rethink of all; it introduced Rack Extensions, enabling the addition of third party plugins - albeit in a manner that was still less open than, say VST or AU. "The ease and simplicity of piling on countless channels for endless amounts of 'New York style' compression and effects makes Reason 7 a total joy to experiment with." By comparison, Reason 7 doesn't really pack any seriously headline-grabbing changes. There's the long-requested addition of MIDI Out, deeper editing of audio recordings, the ability to convert recordings to REX files, a number of mixer tweaks and the new Audiomatic Retro Transformer effect. But there are no new instruments and no capabilities that - on first glance at least - don't already exist in rival DAWs. So is there enough within Reason 7 to make it worth the fairly substantial update price of €129/$129? In short, yes. While Reason 7 might not match previous releases on the bells and whistles front, dive in and what you'll find is by far the slickest, most refined and most outright usable version of Reason so far. In a way it's quite surprising that the ability to send MIDI out of Reason wasn't added when audio was introduced in version 6. Still, it's a welcome addition here and in true Propellerhead style it's been implemented in a simple and pleasantly straightforward manner. Simply add the External MIDI Instrument to the rack and select the appropriate destination from its drop-down list and your hardware is hooked up to Reason. Around the back the device has a Gate In and CV Ins for Pitch/Mod Wheels and an assignable CC control, opening up a host of fun options involving hooking external hardware up to other Reason rack devices via the DAW's much-loved animated patch cables. There have been some great changes to the way in which Reason works with audio, too. Once an audio clip has been recorded or imported into the sequencer window, hit Quantize and the recording will be sliced, adding warp markers attached to each transient. These can be quantised to the beat grid or dragged as you wish, enabling completely free retiming and morphing of the recording. Reason's audio engine handles the whole process impeccably, too. We drastically retimed bass parts, synth lines and vocal samples and the results were some of the smoothest, most artifact-free we've heard from any DAW. Once an audio clip has been sliced it can then be bounced to REX format in one click too. Do so and Reason brings up the option to send the new file directly back into the rack, opening up a new instance of the Dr Octo Rex loop player, for playback and manipulation of the newly created sample. It's all a brilliantly smooth and simple process, and one that really opens Reason up to handling audio recording and manipulation tasks that a lot of users may well have turned to other DAWs or plugins for in the past. It's an effect - supposedly inspired by iPhone apps like Instagram - that degrades and distorts sound in a retro way. It features 16 presets, with names like VHS, Tape, Vinyl, Circuit and Wash (inspired by a washing machine,) that mimic the sound qualities of a variety of vintage appliances. The results are fun, and you can certainly produce useable effects of a decent quality, but the device doesn't allow you to go particularly deep. Controls are limited to Dry/Wet, Gain and a vague Transform knob, which allows minor tweaks to the quality of the sound. What we will say is that it's undoubtedly one of the best looking effects we've seen in a while. Its UI is based around a '70s style TV screen, which displays wonderfully nostalgic pictures of whatever the device is mimicking at the time. Since it was introduced with version 6, the well-modelled and beautifully designed SSL-styled mixer has quickly become one of the best features of Reason - and it's here that we find version 7's trump card. There have been a number of subtle refinements to it that genuinely enhance workflow. Firstly, it's now possible to create parallel versions of any channel in one click, along with an unlimited number of bus channels. This may seem like a minor addition - after all, these sorts of routings were already possible in previous versions of Reason via the Spider Merger/Splitter device - but the ease and simplicity of piling on countless channels for endless amounts of 'New York style' compression and effects makes Reason 7 a total joy to experiment with. Reason has always been known for its stability and it comes into its own here; in our test we created multiple parallels of each element of our track, routed everything to busses and even created parallels of our busses. The DAW barely flinched. There were occasional latency issues when we tried the same thing involving lots of instances of third-party Rack Extensions, but on the whole we're very impressed. Reason's console has always looked and sounded great, but it now feels more inspiring and fun than ever - a genuine joy to experiment and mix with and a really simple way to get everything sounding full and properly fleshed out. The other addition to the mixer is the fantastic spectral analyser that has been added to the EQ section. It appears as a nicely designed pop-up window that can be called up either from the console or from the rack. It gives graphic feedback on the signal coming through each channel, as well as allowing much more accurate and detailed control of the SSL-style EQ and filters. Again, it's a great little addition to Reason's workflow, making it feel more complete than ever. Finally, Propellerhead has updated and added to the DAW's bank of factory sounds and loops. There's an impressive number of sounds on offer, from an unusually wide range of genres. As is often the case with a DAW's built-in sound library, when used in isolation many of the loops - particularly some of the dubstep and rock leaning sounds - can sound a little generic. They're all high quality, though, and there's no shortage of beats, loops and presets to play with for inspiration. While many of the additions in Reason 7 may appear minor at first glance, they all add up to one of the most enjoyable music making experiences you're likely to find as a computer musician. Everything we've always loved about Reason is still here - it's stable, the audio engine sounds great, it looks brilliant and, while there are no new instruments in this version, Reason still packs some of the best-sounding built-in synths of any DAW. The new additions make it more complete than ever. Between the new audio capabilities, MIDI Out and the refined mixer, Reason suddenly feels like a hugely capable bit of production software. Sure, there are still some deeper tasks that may need to be farmed out to other DAWs (which can still be easily achieved thanks to ReWire,) but there are now more reasons than ever to consider using Propellerhead's DAW as your main music making platform.